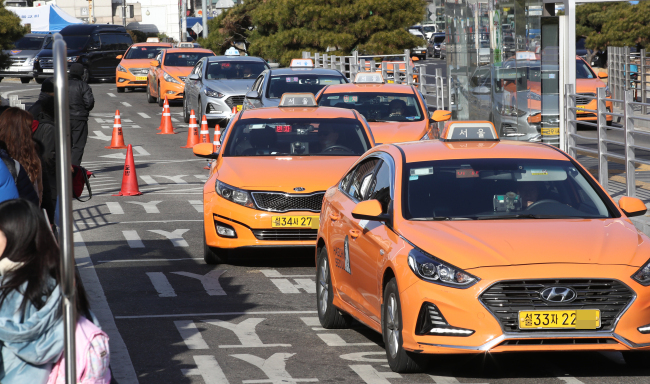 The basic taxi fare in Seoul will rise 26.7 percent to 3,800 won ($3.4) starting as early as the end of next month in the first hike in five years, the city government said Wednesday. The Seoul Metropolitan Government passed the plan to raise the basic rate for cabs operating in the capital city from the current 3,000 won, which was set in 2013. Large-sized van-type and deluxe taxis will see their basic fare go up 1,500 won to 6,500 won, according to the city government. The basic fare for late hours from midnight to 4 a.m. will also rise from 3,600 won to 4,600 won, it said.